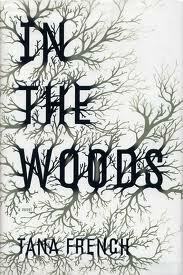 When Tana French’s first novel In the Woods was published in 2007, critics and mystery lovers went wild. The book was an Edgar Award winner (no small feat for a debut novelist) and for a while everyone was talking about it. It’s been on my TBR list for ages…and I finally picked up a copy at the library book sale this year. In the Woods is Rob Ryan’s story. Ryan is a Murder detective in Dublin, Ireland. He and his partner, the spunky Cassie Maddox, have been given the task of determining who killed twelve-year-old Katy Devlin and left her body in Knocknaree Woods. As with all good police procedurals, In the Woods offers readers plenty of red herrings and plot twists – all of it anchored by the relationship between Ryan and Maddox. In 1984, three other children went missing in Knocknaree. Two of the children were never found. Ryan was the third. When I was found I was wearing blue denim shorts, a white cotton T-shirt, white cotton socks and white lace-up running shoes. The shoes were heavily bloodstained, the socks less heavily. Later analysis of the staining pattern showed that the blood had soaked through the shoes from the inside outwards; it had soaked through the socks, in lesser concentrations, from the outside in. The implication was that the shoes had been removed and blood had spilled into them; some time later, when it had begun to coagulate, the shoes had been replaced on my feet, thus transferring blood to the socks. The T-shirt showed four parallel tears, between three and five inches in length, running diagonally across the back from the mid-left shoulder blade to the right back ribs. Ryan doesn’t remember a thing. Nothing from the moment he left the house with the friends to go into the woods – where they had played all the time – until he was found and being examined in the hospital. So when he has to return to Knocknaree, it opens the proverbial can of worms. Are there any parallels between the Devlin case and his own? Will he finally remember what happened all those years ago? The Devlin case is interesting and as Maddox and Ryan knock on doors, ask questions and try to piece together who would have killed Katy, Ryan also wrestles with his own complicated past. All of it makes for page-turning goodness. And the icing on the cake: Tana French can write. I mean, a great mystery doesn’t really depend on stellar writing to be entertaining and fun to read, but French gives you more bang for the buck: a compelling mystery times two, characters who are complicated and human, and writing which forces you to slow down. As you know, I am a huge fan of Thomas H. Cook – a mystery writer who cares about the writing, too. I’d definitely stick French in that category and I look forward to reading more of her work. This entry was posted in Book Chat and tagged 2013, Book Review, highly recommended, mystery, prize winner by Christie. Bookmark the permalink.